What is the Number One Cause of Accidents? According to Combustion Safety website, the number one cause of combustion related accidents are “human error and poor maintenance.” They give several examples of potentially explosive scenarios, such as valves leaking unburned fuel downstream to accumulate in firing chambers — not to mention incorrect purge times, miscalculated fuel-to-air ratios and burner capacity discrepancies. These are all items that ACES inspects during safety checks of ovens, furnaces and other heat-treat equipment. Our technicians receive ongoing training in industry codes and standards such as FPA-86 and NFPA 70, 79, 86, etc. In addition to the components listed above, our safety checks cover burners, valves, gas trains, solenoids, pressure transmitters, pressure switches, process control equipment, process temperature equipment, high limit instruments, air flow, interlocks and more. 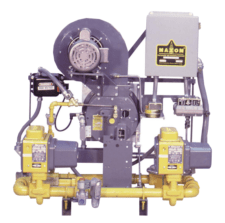 This Maxon 435 OVENPAK® Gas Burner System includes some of the elements that ACES reviews in a safety check: combustion blower, burner assembly, ignition transformer, igniter, safety valves, regulator, modulation valve and regulator. We are also a Maxon dealer and OEM. Regulations call for safety checks, typically once a year, depending on the size of the burner. And — while you might not think about tuning brand new equipment — a safety check must be part of any commissioning process. Every time we install a new piece of equipment, we don’t leave the premises without performing a safety check, and making any necessary adjustments for secure and efficient functioning. One of our technicians was conducting safety checks on a bake-off oven, and when he looked for the testing ports to connect his measuring equipment, there weren’t any. Sometimes companies sell equipment at a reduced price, but skimp on essentials like testing ports. This particular oven was 20 years old, which means safety checks had never been done since the initial installment. The tech had to dismantle some piping and install testing ports before he could complete the safety check, which revealed leaking gas valves, and faulty pressure switches, resulting in pressure that was too high or low. The company could have been fined for violations, or worse, provoked an accident resulting in irreversible damage to their plant, products and personnel. To see more stories about what happens when the start-up or commissioning process isn’t properly completed, go here. For machinery that works simply, efficiently and securely, give ACES a call to schedule your annual safety checks today.